You wouldn’t, would you—not with America’s most revered culinary emblem—Thanksgiving turkey? In this age of culinary iconoclasm, shouldn’t a few classics remain sacred? So don’t let a man with a can even get near a fowl so profoundly American, Benjamin Franklin wanted to make it our national bird. Well, recent times have broadened our definition of icons—and turkey. The latter has been ground into burgers, stuffed into hot dog and sausage casings, and sizzled in deep-fat fryers. Has the gleaming mahogany-hued oven-roasted bird depicted in Norman Rockwell’s 1943 painting “Freedom from Want”—a nostalgic Thanksgiving symbol for generations of Americans—become an endangered species? Well, sorry, Mr. Rockwell, but here comes the strangest incarnation of all: beer can turkey. You’re surely familiar with beer can chicken, a whole bird smoke-roasted vertically over an open can of beer. Roasting poultry in this singular posture has at least three advantages. First, the vertical position enables the bird to roast with convection-like efficiency on all sides, resulting in great color and crisp skin (even on the the back, which can remain wan and soggy when conventionally cooked in a roasting pan in a prone position). Next, the steaming beer rising from the open can seems to humidify the bird from the inside out, keeping the meat moist and succulent—even if you overcook it. Some people believe that the beer imparts a subtle flavor all its own—a flavor real or imagined that seems to become more pronounced the more beer you drink. 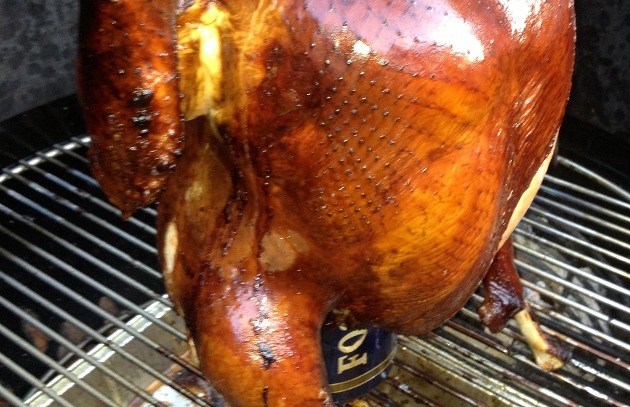 Finally, there’s the spectacle of a turkey roasting upright on a beer can on your grill. Call it a fusion of form and function or call it pure shock value, but the process definitely turns heads. A grill with enough clearance to accommodate an upright turkey. Before you shop for the bird, measure the distance between the grill grate and the top of the grill lid, and don’t be embarrassed to pull out a tape measure at the meat counter. If you own a 22-1/2 inch Weber kettle grill, the company sells a rotisserie package with a metal collar that effectively raises the grill lid by seven inches. The bird itself—8 to 10 pounds work best—ideally locally, organically-raised and/or a heritage breed. The beer can, and here, Australians have come up with the perfect size—a 1-liter can of Foster’s Lager, affectionately called an “oil can”. Finally, you’ll need wood chips—soaked in a liquid, like beer, so they smolder, not catch fire. I’m partial to the light fruity smoke of cherry wood, which is one of the main ingredients in my Best of Barbecue Poultry Smoking Wood Chip Blend. If you want to make the whole process easier to set up, try my beer can chicken roaster. It will stop your bird from tipping and the beer from spilling. Want to go really out-of-the-box for this traditional holiday? Get Miami flavor this Thanksgiving with a adobo-marinated, spit-roasted turkey, served with citrus garlic sauce on the side.